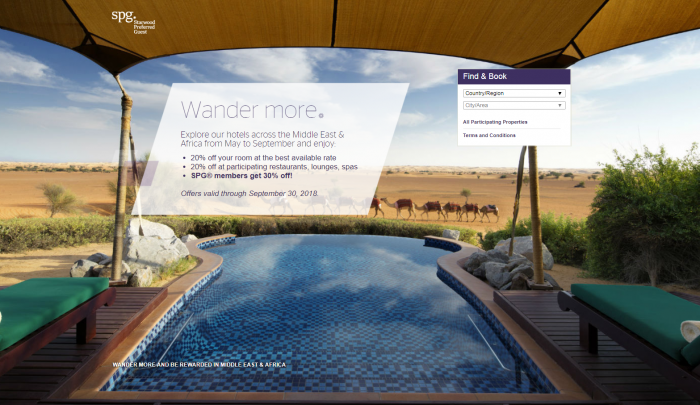 SPG has launched Wander More-sale for stays in the Middle East & Africa until September 30, 2018. Members can save 30% off of stays minimum of three nights and the same discount also applies for F&B/SPA spend. Note that the terms state that the minimum stay requirement can be less or more than the three nights generally required under this offer. Some hotels may require prepayment. I actually wrote about this same offer yesterday when Marriott had launched dedicated website for deals/sales for in the Middle East and Africa region. Seems that they have this Wander More-sale under more traditional pages as well. Offer valid for bookings between April 17th, 2018 and September 25th, 2018 and stays between May 1st, 2018 and September 30th, 2018 at participating SPG Hotels & Resorts in the Middle East and Africa. Discount percentage on rooms is 20 percent off best available rate for non-members, and 30 percent off for Starwood Preferred Guest® members. Offer applicable on stays, dining and spa experiences at participating hotels, outlets, and spas. An eligible stay is defined as consecutive nights spent at the same hotel, regardless of check-in/check-out activity. A qualifying rate is any rate that is eligible to earn Starpoints in the Starwood Preferred Guest® program. To receive the SPG® offer with 30% discount, members must book Rate Plan SPGDI. Hotels may require advance pre-payment. Guests must check the applicable Cancellation Policy before completing the booking process. A minimum of 3 nights is generally required to book this offer. Individual hotels may require more or less nights. All promotions are subject to the Starwood Preferred Guest® program terms and conditions, which are subject to change without notice, and can be found at SPG.com. Guests must show their discount card (obtained at check-in) in order to be eligible for the discounts at participating outlets and spas. Discount does not apply for breakfast, Iftar, Suhoor, tobacco, and shisha. Blackout dates and other restrictions may apply and may differ between hotels.